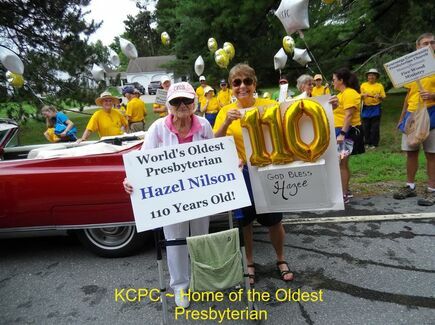 Kearsarge Community Presbyterian Church was organized in 1984, when former Presbyterians in the Kearsarge Lake Sunapee region realized they could form the nucleus of a Presbyterian Church (U.S.A.) congregation. They first met as a fellowship at Colby-Sawyer College. With the support and encouragement from the Presbytery of Northern New England, gathered for worship, and was soon flourishing and proving the viability of a new church development project. KCPC was chartered by the Presbytery of Northern New England on January 23, 1988 with 74 members. The congregation moved from Colby-Sawyer into their present location on King Hill Rd. in the Fall of 1989. Pastoral leadership began when the Rev. George Pomeroy was appointed as the first stated supply pastor through the end of 1984. The Rev. John Wall became the organizing and first installed pastor from 1986 until July 2000. The Rev. Dean Kemper served as interim pastor September 2000 until July 2001. On August 1, 2001, the Rev. Bob Merrill began his ministry as the congregation's second installed pastor. Children's education has been a critical part of the congregation's life. From those early beginnings in the the mid 1980s until the summer of 2001, the Sunday School was organized and staffed by volunteer directors and teachers. Often meeting in very limited space, including restrooms and kitchens! As the congregation built and enlarged their buildings, learning conditions improved and enrollment continued to grow. By the turn of the new century, the congregation was ready for professional leadership in this area. Since then we have been ably staffed. First Colleen Ross served as Sunday School Coordinator 2001-2004. Julie Emery then served as Minister to Youth and Education from 2004-2008. Roberta Hollinger, a charter member of the church, has served as the Director of Christian Education since July 2008. Music has also been an important part of the worship experience at KCPC. In the early years, leadership was provided by a varied group, including Dr. Barban, Will Ogmundson, and Martha Woodrup. In January 1990, Eleanor Alleman became the Music Director and Organist and served the congregation until June 2010. A celebration of her ministry and retirement was held on Sunday June 13, with a visit from the retired Episcopal Bishop of New Hampshire, Douglas Thourner, a long time friend of Ellie. In 2005, the congregation began an early morning Sunday service and called long time New London resident Missy (Olney) Owen as the accompanist. Missy also serves as the Director of our Youth Instrumental Ensemble, which provides musical leadership in worship several times each year. In 2006, the congregation formed a Memorial Hand Bell Choir under the leadership of volunteer Director Ruth Reed. Ruth recruited the initial choir members who began rehearsing with a two octave set of Malmark hand bells. The Bells were given in Memory of Joan Merrill and Robert Wicksman. In 2009 the choir received a third octave given in Memory of Tom Snow. The choir's size and ability have grown considerably under Ruth's leadership. The choir is open to people of all ages. Gary Rothe became the Bell Choir director in 2013. Under Gary's leadership the choir's range and technique have grown as they have explored new avenues for creating the unique sounds only made by hand bells. In January 2010, interest in a Praise Choir arose and soon it was being formulated under the volunteer direction of Emily Cleaveland. The Praise Choir first provided musical leadership in 2010. It is composed of children and members of various ages from elementary school to mid 60s. Several times each year the Praise Choir will provide musical leadership in worship giving a well deserved break to our adult choir. From 2010 until 2015, Tom Tuthill served as the Organist and Music Director at KCPC. Tom's leadership was framed by his creative and humorous spirit which worked well with the easy going nature of the congregation's membership. Tom was known for his famous re-writing of hymns, in which he would write new lyrics to familiar hymn tunes. Each year we were treated to a new rendition of the "Yard Sale Song," which provided many a laugh after our week of hard work. He also wrote and composed his own original Christmas pageant. It was named "Haste" after the name of the herding dog which led the shepherds to find the new born Jesus ("They went with Haste to find the new born babe....") Tom also jumped in wherever and whenever something else was going on the life of the church. He donned an apron on Friday mornings assisting the Presbyterian Women at the weekly Rotary Breakfast, assisted with Youth leadership on Sunday nights, and participated in a whole host of other events in the life of the church. Tom, your friends at KCPC will miss you and wish you and Cricket all the best in western Massachusetts! God bless you and come back for visits often! The church property was acquired in 1987. It is a parcel approximately 5 acres in size with about half of the lot left as natural woodlands and wetlands. 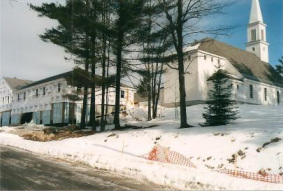 The lot was initially purchased with the generous support of two members of the Presbytery, Elders Seymour Brown from Topsham, VT, and Bob Smith from Bedford, NH. The Sanctuary and first wing were constructed in 1989. Foulkes Hall and building enhancements were completed in 1994. The Office & Education wings, along with a new kitchen, fire safety systems, parking and other building improvements were completed in June 2004. The church pews have an interesting history. Originally they were in a Church in Concord. Eventually the church closed and the building became a Temple Beth Jacob Synagogue. In the late 1980s, the Temple was undergoing renovations and the Temple President was a friend of Pastor Wall, who asked, "What do you plan to do with the pews?" Well the church pews, which became temple pews, came to New London and have sine 1989, served as church pews, again! The church organ was originally the practice organ at Colby Sawyer College here in New London. Sometime in the 1980s CSC had to close their music department. The organ sat unused and neglected for many years. KCPC received a grant to purchase, relocate, and restore the organ. The work was completed by Joseph Chapline and dedicated in 1990. In September 2018, under the direction of technician Rick Hunter, the organ was upgraded to an electronic solid state digital switching system from ______________, of ________, ___. This replaced the original 50-60year old umbilical cable (which was beginning to experience failures) from the console to the pipes, and the electro-mechanical switches at each key, pedal and stop. The cost of the upgrade was $12,000. 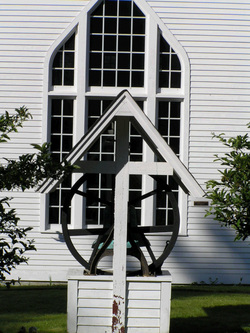 The church bell, a part of KCPC worship service since 1994, called villagers to worship at the United Presbyterian church of East Ryegate, Vermont, from 1923-1983. It seemed appropriate that a church having ended its ecclesiastical life should pass the bell along to a church just beginning. 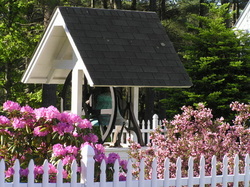 The bell and enclosure are now situated in the center of the KCPC Memorial Garden, adjacent to the sanctuary. The Memorial Garden was first planned in the 1980s. The original landscape plan is hanging in the office wing. In 2004, as part of the education and office wing expansions, and building renovations, the flag pole was relocated from the southeast end of the sanctuary to the northeast side of the garden. During the late summer of 2018, the original walkway in the garden was removed, and a new ADA compliant walkway was constructed. At this same time a light post for improved parking lot illumination was added to the northwest corner of the garden. Missy joined the KCPC staff in September 2006, playing the piano for the 8:15 service. On Christmas Eve 2015, Missy's role expanded to accompany the 10:00 service, the choir and other musicians. She enjoys giving piano lessons and accompanying the Kearsarge Regional High and Middle School Choruses. When not sitting on a piano bench, she is selling real estate. Missy grew up in New London, and presently lives in town with her husband Jeff and 3 children. Having one child recently graduated from college, one a senior in college, and one pursuing her dream to become an Olympic snowboarder, the term empty nester is a term she is becoming used to!